Physically based and conceptual models in hydrology are the two endpoints in the spectrum of modelling strategies, mostly differing in their degree of detail in resolving the model domain. Given the limitations both modelling strategies face, we believe that to achieve progress in hydrological modelling, a convergence of these methods is necessary. This would allow us to exploit the respective advantages of the bottom-up and top-down models while limiting their respective uncertainties. In situ bioremediation of a perchlorate-contaminated vadose zone was conducted through infiltration of electron-donor-enriched water. A vadose zone monitoring system (VMS) provided real-time tracking of the hydraulic and chemical conditions across the unsaturated zone. Variations in concentration profiles of perchlorate, chloride, DOC and bromide in the vadose zone pore water showed limited migration capacity of biologically consumable carbon and significant mobilization of perchlorate. We generate uncertainty intervals for hydrologic model predictions using a simple instance-based learning scheme. Errors made by the model in some specific hydrometeorological conditions in the past are used to predict the probability distribution of its errors during forecasting. We test it for two different case studies in England. We find that this technique, even though conceptually simple and easy to implement, performs as well as some other sophisticated uncertainty estimation methods. The assessment of flood risks in alpine, snow-covered catchments requires an understanding of the linkage between the snow cover, soil and discharge in the stream network. Simulations of soil moisture and streamflow were performed and compared with observations. It was found that discharge at the catchment outlet during intense rainfall or snowmelt periods correlates positively with the initial soil moisture state, in both measurements and simulations. High-time-resolution models for streamflow and stream temperature are used in this study to predict future brown trout habitat loss. Flow reductions falling down to 51 % of current values and water temperature increases growing up to 4 ºC are predicted. Streamflow and temperature will act synergistically affecting fish. We found that the thermal response of rivers is influenced by basin geology and, consequently, geology will be also an influent factor in the cold-water fish distribution shift. This paper presents a skill assessment of the global seasonal streamflow forecasting system FEWS-World. For 20 large basins of the world, forecasts using the ESP procedure are compared to forecasts using actual S3 seasonal meteorological forecast ensembles by ECMWF. The results are discussed in the context of prevailing hydroclimatic conditions per basin. The study concludes that in general, the skill of ECMWF S3 forecasts is close to that of the ESP forecasts. With the aid of a hydrological model and outputs from global climate models (GCMs), we elucidate the spatiotemporal variability of rainfall–runoff in the Congo River basin in the past and in the future under multiple greenhouse gas emission scenarios. We show that the hydrologic model that is forced with outputs from 25 GCMs and two emission scenarios reveal a range of projected changes in precipitation and runoff, and that runoff dynamics are highly sensitive to GCM forcing. We relate land cover (savanna forest and agriculture) to evaporation in Burkina Faso, west Africa. We observe more evaporation and temperature movement over the savanna forest in the headwater area relative to the agricultural section of the watershed. We find that the fraction of available energy converted to evaporation relates to vegetation cover and soil moisture. From the results, evaporation can be calculated where ground-based measurements are lacking, frequently the case across Africa. Rapidly increasing population and human activities have altered terrestrial water fluxes on an unprecedented scale. Awareness of potential water scarcity led to first global water resource assessments; however, few hydrological models considered the interaction between terrestrial water fluxes and human activities. Our contribution highlights the importance of human activities transforming the Earth's water cycle, and how hydrological models can include such influences in an integrated manner. The determination of groundwater age can aid characterization of aquifers, providing information on groundwater mixing, flow, volume, and recharge rates. Here we assess a recently discovered groundwater age tracer, Halon-1301. Its performance as an age tracer is assessed against six other well-established, widely used age tracers in 302 groundwater samples. We show Halon-1301 reliably inferred age, thus potentially becoming a useful groundwater age tracer where other tracers are compromised. This study aims to investigate the evolution of natural and crop vegetation systems over the past 2000 years accommodated with the changes in water regimes at the basin scale. It is based on remote-sensing data and previous historical research. 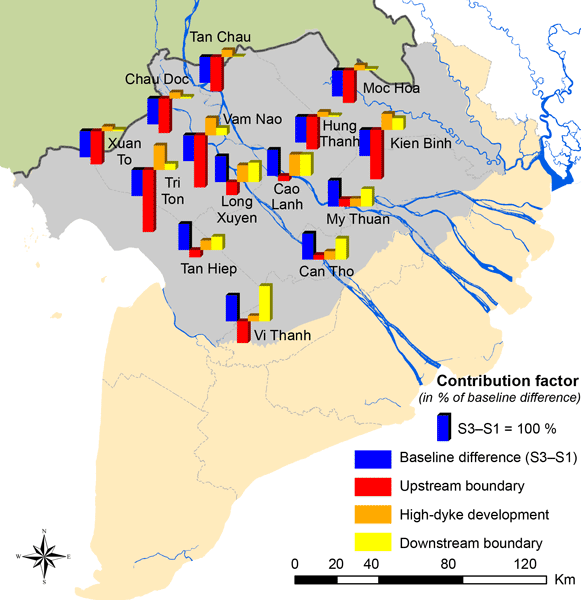 The methods developed and the findings obtained from this study could assist in understanding how current ecosystem problems were created in the past and what their implications for future river basin management are. Evaluation of the uncertainty in projections of future hydrological extremes in the mountainous catchment was performed. The uncertainty of the estimate of 1-in-100-year return maximum flow based on the 1971–2100 time series exceeds 200 % of its median value with the largest influence of the climate model uncertainty, while the uncertainty of the 1-in-100-year return minimum flow is of the same order (i.e. exceeds 200 %) but it is mainly influenced by the hydrological model parameter uncertainty.